PLANNED PARENTHOOD LEAGUE OF MASS, INC.
GRANT enables readers to support New England’s non-profits by choosing which ones are given free advertising space in The Boston Globe. 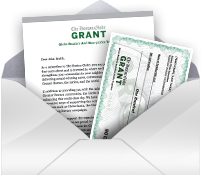 All subscribers receive vouchers for varying amounts of GRANT dollars. Amounts are based on subscription tenure; the longer a subscriber has been with us, the higher their voucher amount will be. Vouchers can then be submitted on behalf of the subscriber’s favorite non-profit. The organizations that receive the most GRANT dollars receive a free ad in the Globe, which they can use to promote their mission, recruit volunteers, request donations or advertise an event. Subscribe today to access New England’s most trusted journalism and participate in exclusive programs like GRANT.